Once you arrive at your Puerto Vallarta resort, you might not want to leave. The brochures say “sun dappled,” which doesn’t say much, but what they meant to say was “incredible.” For travellers who take regular holidays to Mexico, invariably the head for Puerto Vallarta. Maybe it’s the atmosphere, as you have jungle coming in from one side, and sandy beach on the other. Maybe it’s the hospitality – this area relies on tourism so visitors are well taken care of. Whatever it is, it is good. But I do suggest you take at least one day trip during your stay and give your sunburn a break. There are lots of options – here are a few recommendations. To take a drive back in time, head into the Sierra Madre mountains to visit the old Colonial village of San Sebastian. It does look as if time has moved on and left the town, untouched for hundreds of years. This was a mining town, settled in 1605, but today the main industries are coffee and agave. The elegant churches, the bandstand, and some of the larger and more prominent haciendas are 18th century. It is about a 90 minute drive, but there are some airplane flights into here as well – seems overkill, especially when it is such a beautiful drive. You’ve probably seen pictures of El Eden – that’s because it was a film set for Predator with Arnold Schwarzenegger. The only clue if you didn’t know was the crumbling carcass of an old helicopter that was crashed into the hill. 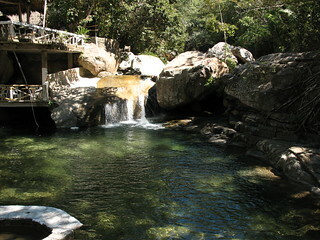 But El Eden is better known locally for its swimming hole – a beautiful spot to cool off on a warm day. You can wade in or slip right in via the small waterfall running into the pool. Next to the pool is a small restaurant, with a great view of the pool. It’s hard to think of a better combination that makes for the perfect day out. You can take a quick taxi to El Eden, or catch the bus which will drop you off about 15 minutes away along a small scenic road – worth the walk. Much of this area is covered by jungle, and probably the jungle ran all the way to the ocean until some intrepid explorers decided to chop it back and make some room for the view. You really must go and check it out, as it’s a stark reminder that Mexico isn’t all beach and resorts. If you’re feeling adventurous, you can ask around and just head down any of the many trails that lead off of the roads around town – one popular starting point is near Garza Blanca. You could also get a guide and do a tour; one that I hear a lot about but haven’t done myself is the canopy adventure tour. This is where you zip line through the jungle, with the optional abseil down a waterfall! There are tour options too where instead of walking (or zipping) you drive jeeps, ATVs, or even horseback. Ask your hotel or accommodation for a suggestion based on your fitness level (and the weather! ), just be sure to have an idea where you are going so you don’t get lost. Mismaloya is a much smaller resort town but otherwise quite similar to Puerto Vallarta, located along the southern edge of the Banderas Bay. Mismaloya is known for great snorkelling and scuba diving because the shore is located in a cove area. You can take a bus or drive to Mismaloya, but there are also options to arrive by sea – day cruises as well as a sunset booze cruise, so you don’t have any excuses on not seeing the town.